Orchard Celebration Kosher Fruit Basket From The Fruit Company. 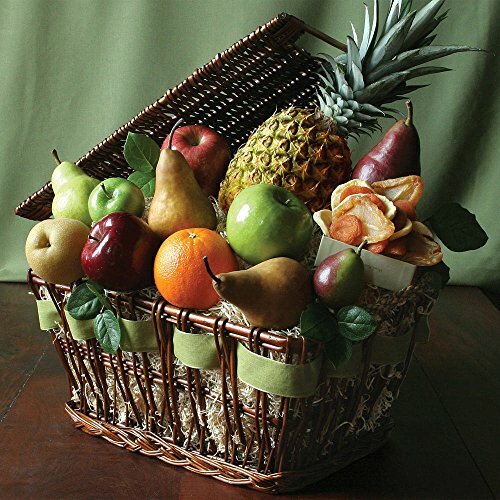 This gorgeous fruit basket is brimming with the season's best - Fuji, Granny Smith, Red Delicious apples; Bosc, D'Anjou, Seckel and Asian Pears, Navel oranges and pineapple. You decide what to celebrate -- a special birthday, a grand accomplishment or just the successful ending of a busy week. With all the fabulous seasonal fruit and our Dried Fruit Medley, the festivities can keep going thanks to this natural abundance. This gorgeous basket brimming with the season's best is worth savoring.